Before looking back on this past year, we'd like to thank the developer community for your involvement and enthusiasm in 2008. Without you none of our accomplishments would've been possible and coming to work would not have been nearly as rewarding or exciting. In 2008 the developer team at Google made it significantly easier for developers to build increasingly sophisticated web apps. Looking back, some of the most notable events from the last year include the App Engine launch, GWT 1.5 launch, Chrome launch, AJAX Language API launch, AJAX Libraries API launch and the broad adoption of OpenSocial. We also worked hard to make it simple to integrate and extend Google applications through the launch of the You Tube API, Visualization API, Maps for Flash API, Finance API and Custom Search API. We were also really happy to participate in the Open Handset Alliance where we saw the announcement of the Android Developer Challenge winners, the Android 1.0 SDK launch, and the first app downloads in the Android Market. 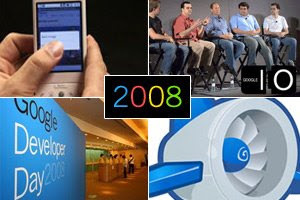 Our favorite part of 2008, however, was interacting with you at Google I/O and at Developer Days. These events allowed us to meet inspirational developers in 15 countries around the world who are building fantastic applications. In 2009, we look forward to building products to make the web better and that let you, the developer community, build better apps on the web. We are already excited about seeing you at events next year. Happy Holidays from the Google Developer Team. I'm really excited about what Google will be working on in 2009 and I wish to see more events for Google in the middle east region to help developers get connected with the latest technologies and best developers in the globe. I know what you should do. Take Analytics for Blogger out of private beta and make it available for the users. I mean you guys already use MeasureMap technology in the new Analytics so why keep the Integrated blogger feature in shadows. hi,google teame i wish meriest of christmas to you and your loved ones,i wish you happiness and prosperity in the year ahead ,thankyou google keep agood works wishing you best succes and prosperties and always happy new year be safe by. Very Happy new year and awaiting for wonderful products from Google . If I could have three wishes for next year, I'd first like an overview of the Code Ecology: in other words, how all the elements of Google Code fit together, how they interoperate. I assumed therefore, that the Code Ecology would somehow help out, letting me use just one language for both the client and server side. Because there was no Here's How Everything Fits Together conversation I could find, I just stumbled on with constant confusion with the two languages. Anyway, and overview of the integration of GWT, GAE, and the whole Ecology would be REALLY WELCOME! .. and naturally, thanks for all the great, great work!